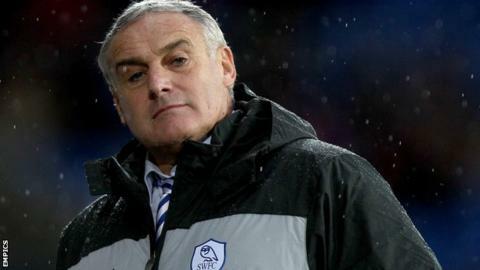 Sheffield Wednesday boss Dave Jones says he is struggling to bring in a striker in the January transfer window. The Owls have failed to score in five of their last six matches and lie 21st in the Championship table, just one point above the relegation zone. He told BBC Radio Sheffield: "We have to cut our cloth accordingly and that could mean letting players out to get someone in. "You have to be realistic. We're not in a position to spend £3m on a striker." Jones added: "Because we haven't signed someone that doesn't mean we aren't working really hard to try and bring somebody here. Sheffield Wednesday have scored just 16 goals at Hillsborough all season. Only Barnsley (12) and Blackburn (15) have scored fewer on their own ground in the Championship. "Scoring goals is a commodity that everyone is looking for, and we made an enquiry for a player the other day and the club were asking for £2.5 million. At the start of the season he wouldn't have been valued anywhere near that." So far the Owls have not made any signings in the January transfer window but have released defender Daniel Jones. Wednesday drew 0-0 with Wolves on Saturday and despite failing to record a victory Jones was pleased with his side's efforts. "We did everything but put it in the back of the net and full credit to the players," he continued. "I can't fault them, they worked hard and we looked like the only side looking to get it down. "If you'd said to me would you'd take four points from the last two games then you would definitely take that." The Owls travel to mid-table Charlton on Saturday.